As the number of Homebrew companies grow, some are preparing for a Series A in 2014 (we’ve backed more teams than are currently public on our website). While very few people start companies simply because they like to meet with VCs, I don’t approach fundraising as simply a ‘necessary evil.’ It’s a chance for our talented founders to celebrate what they’ve accomplished thus far, passionately tell their story and identify the next group of investors to bring on board. I’ve written before about the need to convince a fund that you’re one of the best opportunities they’re likely to see that year (given that they back only a small number of companies). 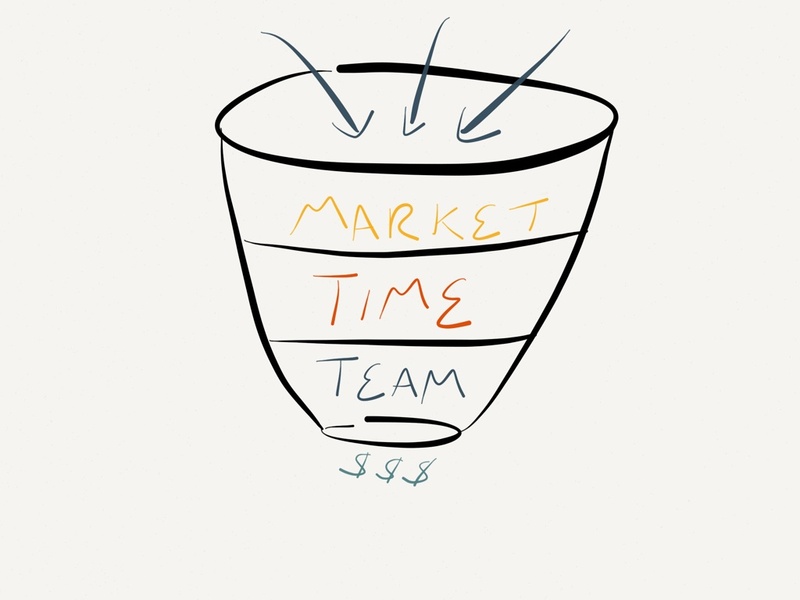 Now I want to spend a few paragraphs on framing the pitch — I call it The Belief Funnel. And your term sheet waits at the bottom. 1. Do I Believe There’s a Market Here? 2. Do I Believe It’s the Opportune Time for Disruption? Once you’ve agreed there’s a big opportunity you might be tempted to skip right away to “…and we’re just the team to win.” But if you do, you’re missing a critical question: is it the right time for a winner to emerge? Some folks will suggest this is a sub-question of #1 but I think it’s important enough to break out on its own. There can be future outcomes that we agree on but disagree on timeline – for example, I’m fairly certain that 3D printing will be available in many homes and businesses, but is that three, five, 10 or 20 years away? Marc Andreessen and Eric Ries were tweeting how many of 1998-2000 web startup ideas failed but are succeeding now. Big market but wrong time vs right time. If you can articulate the sense of urgency and dynamics which make RIGHT NOW the time when a billion dollar company is going to be built, you have a shot at getting the VC to write a check. 3. Do I Believe This is the Right Team? Ok, so now you’re flipping through your slide deck, drawing on the VC’s whiteboard and gesticulating wildly. “It’s the right market! It’s the right time! And we’re the right team!” Here’s where you get to make the case why you win. What have you done/learned thus far that puts you in an advantage position against competitors or incumbents? If a new entrant came into this space today, what’s your moat, your defensible lead? Is there an insight you uniquely have? A technology advantage? A network effect? A distribution relationship? Most discussions of good pitches focus on this question alone but as you can tell, I believe you only move to this section after building “Getting to Yes” momentum. If you can convince an investor this is good market and opportune time, you have them leaning-in towards the deal. Still lots of hard work and good fortune to close the deal, but your term sheet is right on the other side.